Late rent is the most common cause of sleepless nights for landlords. Many scenarios might flash through your mind. “Are they out to get me? Will I have to evict them? What should I do?” This article shares the best advice we’ve heard to deal with a tenant late on rent. There’s a helpful book written about negotiation (not specific to real estate, but general advice) called Getting to Yes by Roger Fisher. The book introduces a key concept called “going to the balcony.” The idea is simply to take a deep breath, mentally or physically remove yourself from the situation, and consider your scenario as an impartial observer looking down on your plight. If you live in the building with your tenant, this might mean going to a coffee shop or a park for some physical separation. If you are obsessing over what to do, this might mean distracting yourself with a movie or searching YouTube for something that might make you laugh like “stand-up comedy.” In either scenario, you want to view the situation dispassionately and with a clear head. When we don’t know what motivates someone, it’s easy to assume the worst. “They’re doing this on purpose!” It’s never a good idea to ascribe malice where bad luck or incompetence will suffice. Most renters who become late on rent are not in it for the thrill of fighting an eviction. Most renters are having other life problems. Do not assume they’re out to get you. They might be, but that’s only one possibility of several. The number one reason a renter becomes late on rent is they don’t have the money. This can result from several factors, some of which are the landlord’s responsibility. For instance, a tenant may be out of money because the landlord approved their application but they are structurally unable to afford the rent over the long term. This would be a screening mistake. Would you be surprised to learn that half of all American households have less than $4,500 in bank accounts or cards that they can use in an emergency? A tenant who signs up to spend more than they earn will slowly draw down on this savings. One day, there will be no more savings. The rule of thumb is that renters should make three times more than their share of the rent. This is a good start and should be customized for each business. A tenant can also run out of money because of bad luck. A renter who performs well at their job might be laid off or have their hours reduced as part of a downsizing decision made many levels above them. There might be state or federal policy changes that impact their industry. They might trip and break their ankle and be no longer able to perform their job of lifting or making things. A tenant can also run out of money because they make decisions that don’t prioritize rent. How many times have landlords seen empty boxes for big screen TV’s sitting in the dumpster, only a month later to find that rent for one of their units is going to be late? Medical bills, child care, vacations, and furniture might all be prioritized before rent and housing. 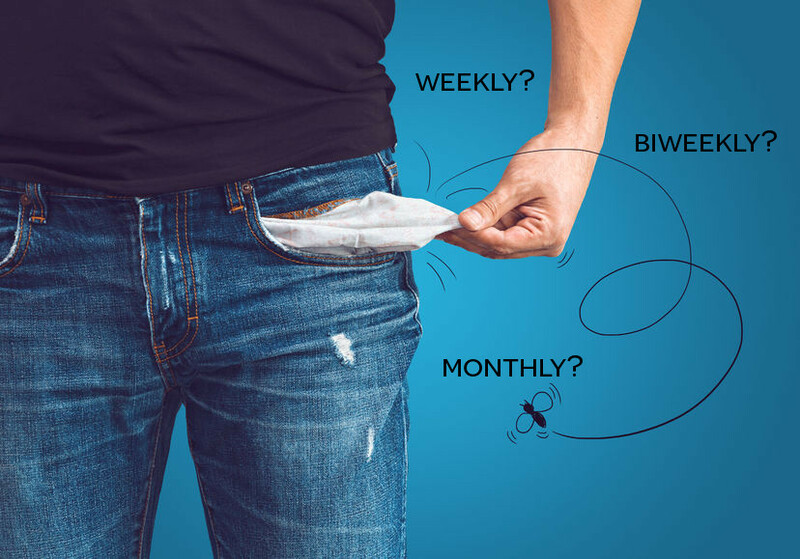 It’s especially easy to prioritize non-essentials over rent because of the way we typically collect rent monthly, but pay is typically weekly, biweekly, or twice monthly. Setting aside the rent from each paycheck requires advanced household budgeting that simply eludes a lot of renters. Modern life can be hectic for some. Traffic hardly moves, medical bills are incomprehensible, kids need to be taken to after-school activities, and the same cooking, cleaning, and home financing needs to fit around occupations that are increasingly “always on” or chaotic hours. When routine days have become a thing of the past, routines like paying rent on the first are easily forgotten. Whatever the reason for being late on rent, landlords can help themselves enormously by communicating regularly with their renters. Communications don’t have to be about rent. In fact, it’s best if every time you text, call, or email your renters, they wonder what it is you’re going to tell them. Let them know if you’re going to be repairing the building, or if you’re aware of a neighborhood event, or if the city or town will be working on the street. Keep in touch with your renters so the general tone of conversation is “I’m here to help.” When you eventually ask “Where’s my money” you won’t sound like a broken record and the question will be heard with more emphasis. Of course a lot of communication can and should be made in connection with rent payments. It never hurts to give a reminder a couple business days before rent is due that rent will be due. This helps renters remember to go to the bank to deposit money for the rent check, or do this online, and still have banking days left in the month. Constructive dialog – especially open-minded questions like “Is everything all right?” – will help your renter feel safe in confiding their bad cashflow management, bad luck, or grievance with your property. You can’t work through the difficulty if you don’t communicate. You might not want to hear what they have to say, but bad news is definitely better than “no news” because now you know. If your renter is late on rent because of cashflow management, but overall it seems like they should be able to afford the apartment, then you should seriously consider a rent payment schedule tied to the renter’s income. For example, if a renter is paid weekly, and their pay should be adequate, but they just keep spending it on things they should forego, then the rental agreement should be converted from a monthly rental to a weekly rental. To make a weekly rental, don’t just divide the monthly rent by four. There are actually 4.3 weeks in the average month. If your renter pays one-quarter of the rent each week, by the end of the year they will have overpaid relative to the rental agreement. If you divide the monthly rent by 4.3, but keep the written agreement in terms of rent due monthly, be ready for the fact that your books won’t reconcile against the agreement at the end of the year. The best advice is to sign a new weekly rental agreement at a weekly rent you both agree on. If your renter is late because they are structurally unable to afford the rent, and now after living in the apartment for a time you both can see this, then you can modify the rental agreement to add on another income earner as a roommate or permit subletting a room (e.g., Airbnb). This might reduce the rent by half for your current renter, a huge savings. You might be able to charge 10% or 15% more total rent for the additional occupant. Everyone will win. Be careful that both you and your renter screen the potential add-on. You need to be sure that they will be a good tenant. If your current tenant leaves, you might be left with just the roommate to hold the bag. You also want your renter to participate in the screening so they feel comfortable they can live with the new roommate. The best way to add-on a roommate is to write down your screening criteria, give them to your current renter, and have them shop among their friends for a candidate. When they have someone they want to live with who seems likely to pass your screens, you can take a rental application. If your renter is structurally unable to afford the rent, and a roommate is not desirable, and there is no schedule change that can prioritize rent above other expenses, then your tenancy may be unsustainable. Filing for eviction is not cruel. On the contrary, many states have social safety nets that can only spring into action once a renter is in court. If the renter would be eligible for emergency subsidies, the court or a state-appointed attorney can help. There is no reason that filing for eviction has to stop your negotiation with the renter. You can file your paperwork in a quick, friendly way and still try to find a peaceful solution. This is the strategy employed by The Good Landlord, a book we recommend. For instance, you can usually pay a renter to leave. Depending on how expensive the eviction process is in your state, it may be far cheaper to offer a renter a sum of money to be presented when the unit is empty and the keys are returned. Your renter may demur. If so, you can come back the next day and offer more money. Or you can offer to help them find a moving truck. Or you can offer to help them overcome whatever obstacle is keeping them in your unit. Think about the alternatives, and you might realize you’d save on lost rent and court fees. If your renter is causing you sleepless nights, know that you are not alone. This is a common problem. But by viewing the situation dispassionately, understanding the reasons why a renter becomes late on rent, and approaching the solution constructively, you can find a way to bring your unit back to financial productivity and probably help your renter remain stably housed in the process.